Haas team principal Gunther Steiner has slammed the “wild” driver tag which follows Kevin Magnussen. The Dane has gained a reputation in recent years for being erratic both on the track, and with the consistency of his performances. Critics continued to circle last season, with his famous bust-up with Fernando Alonso during qualifying for the Italian Grand Prix intensifying the talk. Steiner, however, says he cannot understand where the the harsh words aimed at Magnussen come from. Magnussen has only two penalty points on his license, compared to team-mate Romain Grosjean’s seven – which puts him level with Max Verstappen and Lance Stroll for the most points. “He somehow got such a bad reputation and the perception is out there that he’s this guy which is just wild. Which is wrong,” Steiner added. Steiner also quashed claims that Magnussen can’t keep up with the pace for a full campaign. 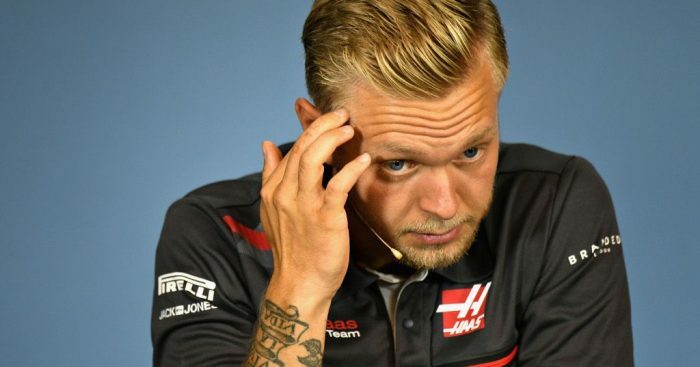 “There is this thing out there that Kevin Magnussen’s second half of the season always is bad,” he explained. “Again, where is this coming from? “He has done some good races in the second half of the season [in 2018]. “Was he as good as the first half? No. But I would not jump to the conclusion that it has to be like this. “I don’t think he is as bad as people make him out to be. He’s a racer. He drives. He fights for his territory.